Through this page you can send us your files. If your thesis or dissertation has 1 or 2 files and it is smaller than 16 MB you can use the web form available on this page is as simple as sending an email. 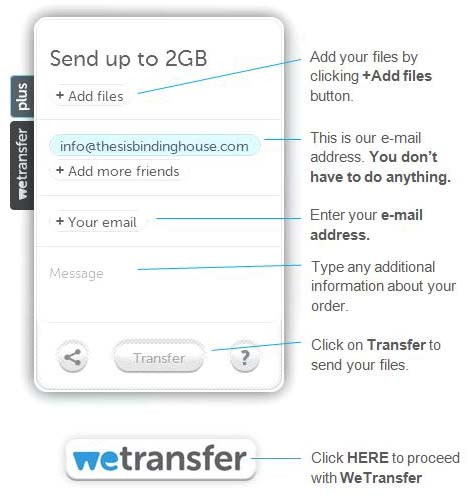 If you have more than 2 files or your files are larger than 16 MB you can use WeTransfer link available on this page, it is very simple you just have to attach the files, specify your email and comments about the order. If you have any questions you may contact us at any time by phone, e-mail or through our Contact Form. Complete the form, attach your files. Click the Submit button. DO NOT CLOSE the window until you see the confirmation message. This process can take a few minutes depending on your connection. There is a link to WeTransfer just below instructions. Just click on the Wetransfer botton and it will open a window like the one shown, add the files you want to send, enter your email and press Transmit.